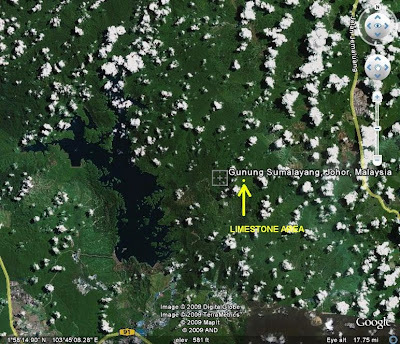 SiputKuning Journal: Limestone in Johor? A couple of weeks ago, I was browsing through a copy of "Johor Bigfoot: The Beginning of A True Story (in Chinese)" There was the mentioning of search results in Johor, about the speculation of the ape's biology and many more so-called physical evidence of footprints and hair samples typical to Bigfoot-themed books. And then, there came the mentioning of its habitat. The accompanying photographs proved so unbelievable that I was convinced the author faked the entire story out just to attract people's attention to some Malaysian folklore. The picture shows a cliff face surrounded by dense rainforest while the other, an ink-dark void with tree roots and rocks around it - a cave. 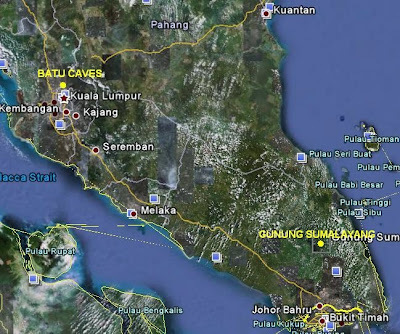 A cave in Johor? A limestone cave? The description is even more intriguing. 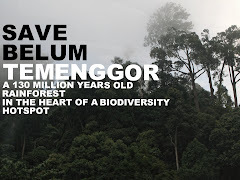 Apparently, the bigfoot researchers guided by the Orang Asli (natives) had came to a rock face and walked around it to a hidden cave in the thick rainforests of Gunung Sumalayang's peak. 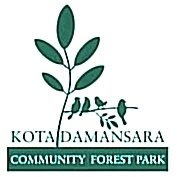 They have had even collected rock samples for the Geological Department of Malaysia to identify the rock type. And voila, it's limestone! Previously, it's a well established fact that the southern most limestone hill is Batu Caves in Selangor, some 370km northwest of Gunung Sumalayang. (Now you understand why I'm shocked?) I googled it up and found the scientific evidence I needed - "The Malaysian Stratigraphy (in Bahasa Malaysia) ". 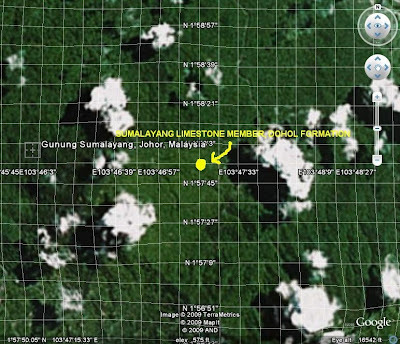 According to the papers, there're minor intrusions of limestone in Gunung Sumalayang. Photographs showing small stalactites and stalagmites on the cliff face backed up the findings. 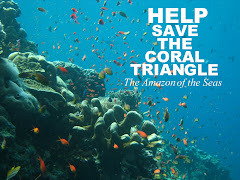 Now, the big question is - are there any endemic snails living there? Since it's just a minor limestone intrusion and not the huge karsts like those in Central and Northern Peninsula Malaysia, it could have only supported a small population of endemic molluscs, if any at all. But, given the amazing diversity of microsnails discovered in just some tenths of metres of limestone in Sabah, it's worth exploring this potential site, right? 1.Norazhar Ngatimin and Teh G.H., 1993. Geology of the G. Sumalayang area, Johor. [abstract]. In: GSM Annual Geological Conference 93, Langkawi, Kedah, 12-13 June 1993, Warta Geologi 19(3):139. Geological Survey Malaysia District Memoir: Gunong Belumut Area, Johore Memoir 19.